The ninety-nine's is a double 9/0 bladed bucktail that is perfect in every way. Another premier in-line spinner bait added to Spanky Baits line up that features a unique action "FLASHABOU" Tail. 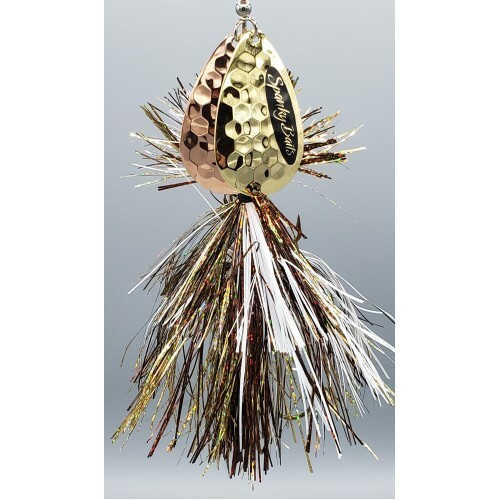 The Ninety-nine is a top producing tinsel lure, this spinnerbait will help you catch muskie and northern pike The vibration of the magnum blades along with the visual addiction of the Flashabou makes this a lure that will go down in history. All this lure does is catch monster fish like large musky and northern pike. These lures have a crazy action and attract fish in a big way.